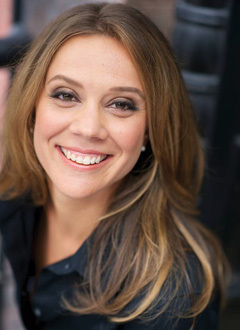 At a professional development I was co-facilitating the other day with the Western Massachusetts Writing Project, we were very fortunate to have Maggie Roberts (from Teachers College) skype into our session to chat with us about the idea of informational writing. This has been one of the topics that we have been exploring with this group of teachers for much of the school year, and Roberts thoughtful analysis and sharing of strategies and conceptual ideas around the shifts to more informational writing was very helpful. Structure the writing — flow from start to middle to finish. I think we all found these ideas handy to keep in mind when our students are working on informational text, and we even talked a bit about how students have an internalized understanding of fiction (because it is a central part of their reading and listening experience) but not so much with non-fiction, and that makes moving from reader to writer all the more difficult. It requires much scaffolding and mentoring. Here is some video from a recent gig of my rock and roll band, Duke Rushmore. We had just learned this song and the singer just learned the riff on xylophone (as well as just learned the xylophone), so we pulled a woman from the audience (it was her birthday!) to hold it for him, and for someone to sing to. (I am the saxophone player). Right before the song started, she turned to me and whispered “I don’t want to do this!” but the drummer counted off the song and we were off. She ended up having a birthday to remember. 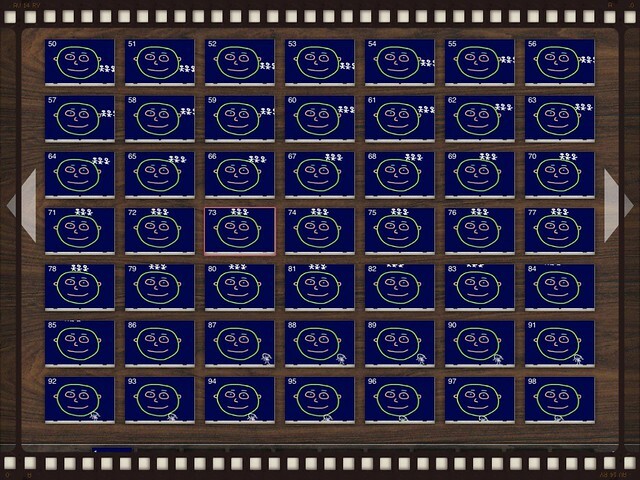 You may be a little weary of my chatting up the Making Learning Connected Massive Open Online Collaboration (MOOC) that I have been involved with over the last few weeks with the National Writing Project. I’m excited about it. I’ve shared out a lot of teasers, but today, we officially launched the MOOC and I want to invite you to join us. If you are a little leery of the time involves, it’s OK. You truly will determine what works for you. If you just want to lurk, go ahead. Just tweet every now and then? Fine. Go knee-deep into the activities? Even better. There are plenty of informational pages along the top of the MOOC site, by the way, in case you are curious or have questions about how the MOOC might unfold. This one — Getting Started — is the perfect place to begin. But I encourage you to come along for the ride. The opening post was published this morning, encouraging you and me and us to craft an introduction to ourselves, considering some use of media or symbolic representation. Who are you and how can you represent yourself to the world? 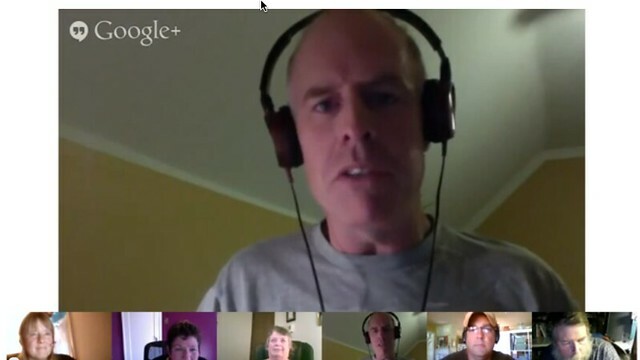 Check out the blog post for more information about the first Make Cycle of the MOOC. I hope to see you there, here and everywhere! 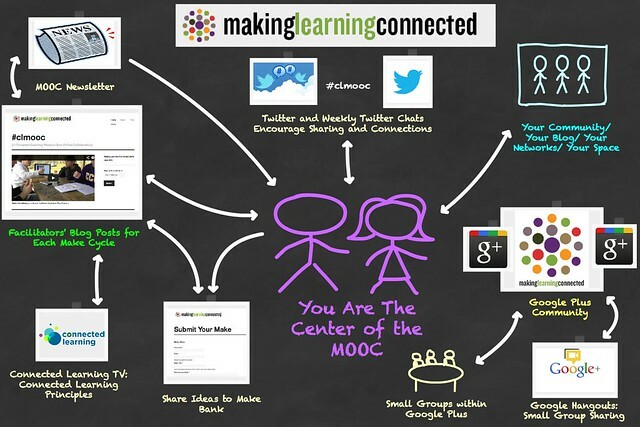 Making Learning Connected MOOC Countdown …. Tomorrow marks the official launch of the Making Learning Connected Massive Open Online Collaboration, and boy, it is exciting to think about getting this adventure off the ground after weeks of planning. As one of the facilitators, I have been working hard with the others to get all the pieces in place necessary for you to have a grand ol’ time this summer. (What? You haven’t signed up? Come join us.) We have tutorials, guides, suggestions, and more … all with an eye to help you get the most out of the MOOC. On Saturday morning, we will be posting our first Make Cycle post (we’ve designed the MOOC around Make Cycles, which will have various themes to consider), followed by a newsletter, and then the start of some introductory activities. We’re aiming to ease folks into the MOOC experience. I created this diagram to help me visualize how the interactions and connections might take place. Since we’re really honing in on the open part of the adventure, the sharing and connected spaces are decentralized, hovering around the participants. That mean that things may be taking place in different spaces, at different times, and the challenge is to keep some of those threads together. Maybe this will help you conceptualize it, too. We will be repeating this message a lot: You are in charge of making meaning of the MOOC. You enter the conversations and Make Cycles where it works for you, you participate when you can, you guide your learning. It’s OK to lurk and check things out, It’s OK to just follow on Twitter, or take part in our Google Plus community, or to blog in your own space, or write in your network area. This MOOC is about you, not us, although we do hope you will make connections. So, come on and make something with us this summer. We can’t wait to connect with you. Our Western Massachusetts Writing Project just published a second round of profiles of teachers with lesson plans around writing, complimented by student work. It is called Writing to Go, and I was lucky to have been asked to contribute to the publication. My topic: teaching the synthesis of reading across multiple texts and using evidence from those texts in analytical writing. (This is also my main teaching goal this year). The book has a wealth of great ideas, from using images to inspire writing, to how to build a sense of community through reading and writing, to using primary sources to inform writing, to how to best analyze the potential of quotations and dialogue. 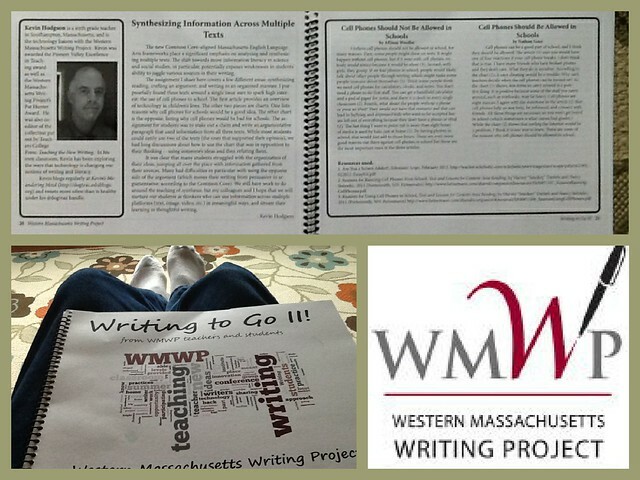 Writing to Go was rolled out at the WMWP 20th anniversary last week and will go on sale through the WMWP office and website in the coming days. It also provides a nice look inside the work being done by various WMWP teachers. Music and songwriting have always been ways of protest. Check out this rap by a teacher, Jeremy Dudley, that hits hard against this age of testing everything. You can find more out about the video over at the Answer Sheet, where I first found this rap. We’re now just days away from launching the Making Learning Connected MOOC and here is another invitation for you to join us. I made it with a site called Wondersay, which creates animated text.